WASHINGTON (Reuters) – Tom Mauser came to the U.S. Capitol on Tuesday dressed in gray Vans sneakers, the same ones his 15-year-old son Daniel wore when he was killed by two gunmen at Colorado’s Columbine High School in 1999 along with a dozen other people. 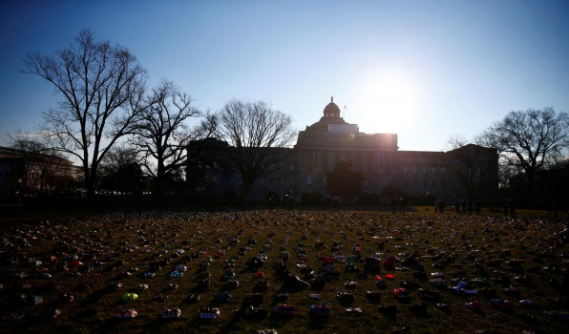 Mauser was one of a handful of gun control activists and volunteers who braved a frigid March morning to lay out about 7,000 pairs of shoes on the U.S. Capitol lawn as a makeshift memorial to American children killed by gun violence. Their aim, like the thousands of students across the country who plan to walk out of their classrooms for 17 minutes on Wednesday morning, was to put more pressure on state and federal lawmakers to tighten rules on gun ownership. “There’s nobody in those shoes, it’s like the emptiness in our hearts from gun violence,” said Mauser, 66, of Littleton, Colorado. The memorial, organized by Avaaz, a U.S.-based civic organization, and the National School Walkout, organized by the activists behind the Women’s March in Washington, are part of a grass-roots movement that grew out of the killing of 17 students and staff at a Florida high school a month ago. “I think we’re in the middle of a cultural change in the United States. The majority of Americans want a change in gun laws, and a majority of gun owners want change,” said Emma Ruby-Sachs, deputy director of Avaaz. Many of the proposals favored by gun control advocates, including a ban on assault-style weapons and the closing of loopholes on requiring background checks before gun purchases, are fiercely opposed by the National Rifle Association and its supporters. The 7,000 pairs of donated footwear, arranged side by side in a trapezoid shape outside the Capitol, represent every person younger than 18 who has been killed by a firearm since the 2012 massacre at the Sandy Hook elementary school shooting in Newtown, Connecticut. Actresses Susan Sarandon and Bette Midler, and talk show host Chelsea Handler were among shoe donors. About 1,300 people below the age of 18 are killed by gunfire in the United States every year, according to the U.S. Centers for Disease Control and Prevention. On Wednesday, students will again take center stage in the political theater over guns that has gripped the country since the Feb. 14 shooting at Marjory Stoneman Douglas High School in Parkland, Florida. The national walkout will last 17 minutes, beginning at 10 a.m. local time, to commemorate the 17 victims who lost their lives in the Florida massacre. It was the deadliest school shooting since 20 children and six adults were shot dead at Sandy Hook more than five years ago. The walkout has won the support of many school districts and civil rights organizations, including the American Civil Liberties Union. More than 2,500 walkouts are scheduled across the country, according to the organizer’s website, including at Marjory Stoneman and Columbine high schools. Mauser, a retired Colorado Department of Transportation employee, has attended dozens of gun-control demonstrations since the Columbine massacre. But he has grown cautiously optimistic about the prospects for change because of the new student involvement. “These kids, it’s their lives. They’re not going to be distracted about Russia, about other things,” Mauser said. The shoe memorial is reminiscent of a monument on the Danube River near the Hungarian Parliament in Budapest commemorating thousands of people, including Jews, killed by fascists in the 1940s. 7,000 pairs of shoes rest peacefully in the grass outside the U.S. Capitol today. Each pair represents a child lost to gun violence since the shooting at Sandy Hook Elementary that took the lives of 20 young children and six adults in 2012.